Growing up, I always loved comic strips. I couldn’t get enough of Condorito, Mafalda, Archi and La pequeña Lulú. Looking back, I know at least the jokes in the first two were more for an adult audience than anything else, but I still loved them! While I haven’t introduced my kids to any of these comic strips just yet, I recently got my hands on a copy of El globo grande y mojado a TOON book by Liniers, a renowned Argentinian cartoonist who draws his inspiration from his own two little girls. My daughter, who’s 7 years old and an avid reader, was immediately enthralled by a format she’s not really familiar with and wasted no time taking over and reading the sweet story to her little brother. The best part is that she actually made different voices for Matilda and her little sister Clementina and made the sound of the different noises Liniers includes throughout his easy-t0-read comic. El globo grande y mojado tells the perfect little story of what it’s like to be a big sister — a role my girl had no trouble identifying with which, I believe, is one of the reasons she enjoyed this book so much. Not to mention that the cartoons are truly expressive! 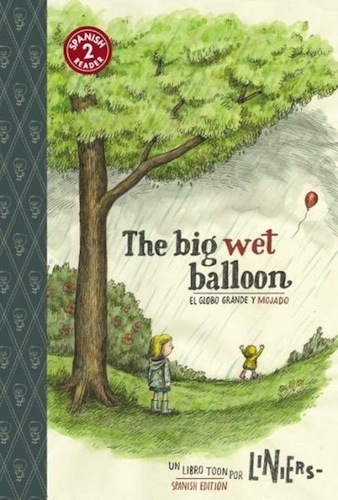 We are giving away one copy of El Globo Grande y Mojado to FOUR lucky winners. All you have to do is leave us a comment letting us know what’s your child’s or your favorite comic strip and enter the rafflecopter below. Garfield. I am an email subscriber. I always loved reading the Archie Comics and Betty and Veronica! I would get so excited seeing the bright colorful book at the grocery checkout when I was a child. Oh, my daughter loves Babymouse. My fave comic strip was Asterix. We love Calvin and Hobbes! My last favorite comic was Rose is Rose, but I haven’t read comics in way too long and Chiquita has never really read comics (unfortunately). I’m a subscriber. Condorito and my son likes Peanuts. I’m a subscriber. I subscribe and we love Peanuts.